Like SPBHS on Facebook ! 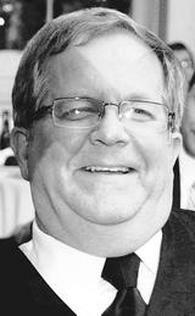 DANVERS — Stephen P. Conway, 57, died unexpectedly on Friday, Aug. 27, 2010. He was the loving husband of Janis P. (Murphy) Conway, with whom he shared 33 years of marriage. Born in Passaic, N.J. on March 17, 1953, he was the beloved son of Robert Conway of Peabody and Bernice "Bunny" (Bartlett) Conway of Beverly. He was raised in Danvers and attended the former St. Peter's High School in Gloucester before graduating from Bishop Fenwick High School in 1971. He went on to graduate from St. Anselm's College in 1975 with a Bachelor's of Science in Economics. A Danvers resident for over 30 years, Steve was a partner in Northeast Flange & Fittings in Peabody. He also worked alongside his son for many years with Conway Landscaping. For many years, he was a Danvers Youth Hockey Coach. He was a loving and dedicated husband, father, grandfather, and friend. In addition to his wife and parents, he is survived by his children, Ryan Conway, his wife Ryanne and their daughter, Ava of Middleton; Robert Conway of Danvers; Timothy Conway of Danvers; and Lauren Conway of Danvers; his brother, Robert Conway of Florida; his mother-in-law, Marie Murphy of Danvers, and a loving extended family. ARRANGEMENTS: His funeral Mass was celebrated on Wednesday, Sept. 1, 2010 at 9 a.m. in St. Mary of the Annunciation Church, 24 Conant St., Danvers. Burial followed in Annunciation Cemetery, Danvers. Relatives and friends were invited. Visiting hours were Tuesday from 4 to 8 p.m. in C.R. Lyons & Sons, Funeral Directors, 28 Elm St., Danvers Square.Donations in Steve's name may be made to the Stephen P. Conway Education Fund, c/o Loren Rocker, Danversbank, 3 Federal St., Danvers, MA 01923. www.LyonsFuneral.com. Rev. Alfred F. D’Alonzo, C.S.C. Rev. Alfred F. D’Alonzo, C.S.C., 88, died Friday (June 27, 2014) at Holy Cross House. The Visitation will be from 3:30 to 7 p.m. Tuesday (July 1, 2014) at Moreau Seminary, where there will be a Wake Service at 7:30 p.m. The Funeral Mass will be at 9:30 a.m. Wednesday (July 2, 2014) at the Basilica of the Sacred Heart at Notre Dame. Burial will be in the community cemetery at Notre Dame. Kaniewski Funeral Home, South Bend, is in charge of the arrangements. The Funeral Mass will be streamed live on the Campus Ministry website. Fr. D’Alonzo was born on July 16, 1926, to Modestino and Michelina (Stanziale) D’Alonzo, in Orange, N.J. He graduated from Orange High School in 1944. Fr. D’Alonzo entered the University of Notre Dame in 1944. He was a member of the Fighting Irish football team. He enlisted in the U.S. Navy on July 1, 1944, and attended Naval Officers’ Training School. Fr. D’Alonzo was honorably discharged on July 1, 1946, and entered the Congregation of Holy Cross on Aug. 15, 1946. He made his first profession of vows on Aug. 16, 1947. Fr. D’Alonzo graduated from Notre Dame in 1949 with a bachelor’s degree in philosophy. He professed final vows on Aug. 16, 1950. He studied theology at Holy Cross College, Washington, D.C., from 1949-1953, during which he also served as assistant chaplain at the National Training School for Boys, a federal correctional institution in Washington. Fr. D’Alonzo was ordained on June 12, 1953. He served as prefect of discipline and a teacher at Fr. Baker High School in Lackawanna, N.Y., from 1953 to 1956. Fr. D’Alonzo earned a master’s degree in educational administration and sociology from Notre Dame in 1960. From 1956 to 1963, he served as vice principal and teacher at Notre Dame High School, Bridgeport, Conn., where he also was assistant superior. During that time, he also was a chaplain to the Sisters of Notre Dame de Namur. From 1963 to 1965, Fr. D’Alonzo served as the Holy Cross Brothers’ chaplain while he was pursing advanced studies in educational administration, supervision and psychology at Fordham University, Bronx, N.Y. Fr. D’Alonzo also was a part-time school counselor at Mt. Carmel School in the Bronx. 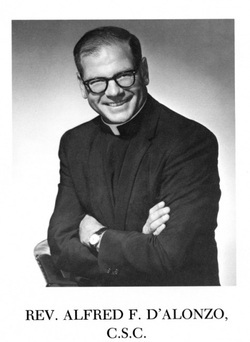 He served as headmaster and religious superior at St. Peter’s High School, Gloucester, Mass., from 1965 to 1969. From 1969 to 1971, Fr. D’Alonzo worked as a research assistant during his doctoral studies at the University of Ottawa, Ontario, Canada. From 1970 to 1971, he served as a counselor and chaplain at Ottawa Teachers’ College. He earned his Ph.D. in educational administration from the University of Ottawa in 1978. From 1971 to 1981, Fr. D’Alonzo was dean of student affairs at King’s College, Wilkes-Barre, Pa. In 1982, he returned to Moreau Seminary to work with Old Collegians and from 1986-1989 was a member of the professed formation team. Fr. D’Alonzo served as chaplain in the Campus Ministry Program at Notre Dame and assisted in the Married Student’s Village. In 1986, he was appointed to serve as director of the Campus Bible Study. Fr. D’Alonzo also served on the parochial team helping in local parishes, particularly St. Peter’s Parish in LaPorte, Ind. Fr. D’Alonzo also served as a counselor for student athletes. He was an assistant rector at Pangborn and Carroll Halls at Notre Dame from 1989 to 1994. He was a priest-in-residence at Carroll from 1994 to 1999 and moved back to Moreau Seminary in 1999. He moved to Holy Cross House in 2008. Fr. D’Alonzo celebrated his 60th anniversary of ordination in 2013. In 1995, Fr. D’Alonzo was awarded the Distinguished American Award by the National Football Foundation and the College Football Hall of Fame. Fr. D’Alonzo is survived by his brother, Frank, his nieces Linda, Lenora, and Kathy, and nephews Frank, Jr., Michael, Gary, Pete, and Michael, and great nieces and nephews, Nicole, Daniel, Christina, Michelle, Michelena, Felicia, Frank III, John Matthew, Gabrielle, and Michael. Kenneth S. Rust, 59, of Derry, NH, died Thursday January 6, 2011, in the Merrimack Valley Hospice House, Haverhill, MA. He was born in Beverly, MA on September 22, 1951, son of William and Phyllis Rust. Kenneth was a proud and active member of the Knights of Columbus, Phil Lessard Council #3023 of Derry. He is survived by his wife and best friend; Chi Rust of Derry, three daughters; twins Katie and Christie Rust of Derry and Malisa Rust of California, his sister; Coleen Gale and her husband Jim of Salem, NH and his brother; Mark Rust of Hampton, NH. He is also survived by many, many friends. Calling hours were held on Tuesday, January 11, 2011 from 5:00 PM to 7:00 PM in the Peabody Funeral Homes and Crematorium, 15 Birch Street, Derry. A memorial service followed at 7:00pm in the funeral home. In lieu of flowers memorial contributions may be made to the education fund of his daughters; checks payable to Katie and Christie Rust, C/O Chi Rust. Please contact Chi Rust directly for additional information. MANCHESTER, NH - Chief William V. Walbourne, 83, who specialized in ships navigation and communications, died Saturday, May 24, 2009. He was a member of the Pacific Fleet Amphibious Forces during WWII; participated in 8 landings and 2 engagements during the Korean War; and was assigned patrol duty off the coast of Cuba during the Cuban Missile Crisis. He was awarded the Navy Commendation Medal with combat "V" by the commander of the Seventh Fleet. Chief Walbourne retired as a Senior Chief Petty Officer in December 1967. Chief William Walbourne, better known as "Chief," became a Naval Science Instructor at St. Peter's Boys High School in Gloucester, MA, also serving as assistant football coach and varsity baseball coach. In 1971 "Chief" then became the Naval Science Instructor of NJROTC Unit at Manchester High School West in Manchester, NH where he also served as athletic director. He retired in 1988 after 17 years as a member of West High School faculty. Chief was a Chapter and life member of the VFW Post 6712 Beachmont, MA and a member of American Legion Post 67 in Weare, NH. Chief was a devout member and Chaplain in the Mason's Bible Lodge 27 in Concord, NH and a member of the Scottish Rite Bodies in Nashua, NH. Chief was also in the Legion of Honor Bektash Shrine in Concord, NH. Family includes his wife Mary R. (Welsh) Walbourne of Manchester; children: predeceased by a son, William "Buddy" Walbourne, Jr.; daughters Rita M. Nelson of Brick, NJ and Mary F. Walbourne of Manchester; 3 grandchildren, Kalyn, Nikki and Hunter along with 2 son-in-laws, Tyler Nelson of Brick, NJ and Robert Archambault of Manchester, NH. A funeral Mass was celebrated Friday 5/29/09 at 11 am at Holy Rosary Church in Hooksett, NH. Military burial services immediately followed at NH Veterans Cemetery in Boscowen, NH. Peabody, MA — Donald F. McCauley, Jr., 58, of Peabody, died early Thursday morning at the Twin Oaks Nursing in Danvers, following a brief illness. Born in Salem, he was the beloved son of the late Donald F. McCauley Sr. and Katherine (Rabchenuk) McCauley. He was raised and educated in Peabody. Before graduating from Peabody High School in 1971, he attended St. Peters High School in Gloucester before its closing. He then attended Emerson College for two years. Donald is survived by his brother and sister-in-law, David and Gail McCauley of Peabody, his sister Maureen McCauley of Lowell and is also survived by two nephews, Brandon and Dustin McCauley of Peabody. ARRANGEMENTS: A private family service will be held next week with burial in Cedar Grove Cemetery. Arrangements were made by the Conway, Cahill-Brodeur Funeral Home, 82 Lynn St., Peabody. To view on-line obituary, visit www.ccbfuneral.com In lieu of flowers donations may be made in Donald’s name to the Twin Oaks Nursing Home, 63 Locust St., Danvers, MA 01923. Beverly — Kevin S. Fitzgerald, 62, of Beverly, formerly of Manchester-by-the-Sea and Gloucester, passed away, surrounded by his family, at the Kaplan Family Hospice House after a brief illness. Kevin was born in Cambridge on June 1, 1950, the son of the late John and Mary (Bent) Fitzgerald. He moved with his family to Beverly shortly after birth and then to Miami, for several years, before moving to Manchester in 1962. Kevin attended school at Manchester Jr.-Sr. High School before transferring to St. Peters Boys High School where he was a member of the first graduating class of 1969. He joined the U.S. Army in February 1970 and served in Vietnam as a helicopter aircraft mechanic and crew chief in Delta Company, 158th Aviation Battalion, stationed at Camp Evans in northern Vietnam. After a year in Vietnam, Kevin was stationed at Fort Hood, Texas, where he served as a crew chief and EMT in one of the units that pioneered the use of helicopters for emergency medical evacuation services for both military and civilian personnel. After his honorable discharge from the Army, Kevin returned to Manchester and joined the Manchester Police force where he served for seven years. He was appointed a reserve officer on the Gloucester Police force in 1976. He transferred to Gloucester in 1979 where he served until retiring as a Sergeant in 1992. Since retiring from law enforcement, Kevin has been a private investigator, a lobster fisherman, and most recently he founded and managed a landscaping service. Throughout his life, Kevin has been an active outdoorsman, sharing his outdoor adventures with family and friends in every season of the year. An avid and accomplished hunter and fisherman, his greatest joy was introducing his children, nieces and nephews to the beauty of nature during numerous hiking, mountain climbing, canoeing and camping trips. Kevin is survived by his wife, Salma; daughter, Kelly and her husband, Al Thompson; grandchildren London and Hudson of Broomfield, Colo.; daughter, Kara of Thornton, Colo.; step-son, Gustavo San Andres of Tewksbury; step-daughter, Susan and her husband, Peter Colon; grandchildren, Gabriela and Olivia of Tewksbury; sister, Jean and her husband, Lenny Capello of Manchester-by-the-Sea; brother, Jim of Gulf Breeze, Fla.; brother, Dave of Essex. Kevin was pre-deceased by his sister, Carole and brothers, Jack and Brian. ARRANGEMENTS: A funeral mass will be celebrated at Sacred Heart Church, 62 School St., Manchester, Saturday, January 5, at 10 a.m. Relatives and friends are invited to attend. Visiting hours at the Campbell – Lee, Moody, Russell Funeral Home, 525 Cabot Street, Beverly (North Beverly location), Friday from 4 to 7 p.m. Burial in Pleasant Grove Cemetery, Manchester. In lieu of flowers, expressions of sympathy may be made in Kevin’s memory to the Kaplan Family Hospice House 78 Liberty St., Danvers, MA 01923. Information, directions and condolences at www.campbellfuneral.com. REV. FRANK A. TOSTE, C.S.C. Reverend Frank Toste, C.S.C., 85, died at St. Luke’s Hospital in New Bedford, Massachusetts on Wednesday, July 6, 2011, following a brief illness. Father Toste was born on March 20, 1926 in Providence, Rhode Island, the son of Anthony and Mary (Pental) Toste. He entered the U.S. Navy in March of 1944 and was honorably discharged in 1946 after service in the U.S., Europe and Africa. He received a B.A. from Stonehill College in Easton, Massachusetts. Father Toste entered the Congregation of Holy Cross and made his first and final vows on September 12, 1954 and August 16, 1958, respectively. He was ordained a priest on April 30, 1960. He received an M.A. in Theology from Holy Cross College in Washington, D.C. in 1960 and an M.A. in Literature from Harvard University in Cambridge, Massachusetts in 1991. Father Toste taught at Notre Dame High School in Bridgeport, Connecticut and was camp director at Camp Sebaik in Maine. He taught at St. Peter’s High School in Gloucester, Massachusetts where he became assistant principal in 1969. Father Toste also taught at Peabody High School in Peabody, Massachusetts where he was head of the drama department. While pursuing doctoral studies at the Union Institute of Cincinnati he assisted at St. Anthony’s Parish in Sanbornville, New Hampshire. In 2008, he retired to Cocoa Beach, Florida until his return “up north” to the North Dartmouth community in 2010. Always an avid stage and screen participant, Father Toste received certificates in Cinema from the School of Cinema/Television at the University of Southern California and the Feagin School of Drama and Radio in New York City. He was most proud of his affiliation with the film,” Love Story,” in which he had a speaking role and met the co-stars of the film, Ryan O’Neil and Ali MacGraw. Fr. Toste was also an Equity Actor and a technical advisor for the long-standing television series M*A*S*H* and appeared in Oliver’s Story, and was on stage at the North Shore Music Theatre, Beverly, MA. He was a long-term member of the Screen Actors Guild. Fr. Toste was proceeded in death by his parents, Anthony and Mary (Pental) Toste. He is survived by his sister, Dorothy Llamas and several nieces and nephews. Viewing for Fr. Toste will be held in the Chapel of Mary, on the campus of Stonehill College, Easton, Massachusetts, Sunday, July 10th 2011, beginning at 7:00p.m, with a vigil service at 7:45 p.m. The funeral Mass will be celebrated Monday, July 11th, at 10:00 a.m. in the Chapel of Mary on the campus of Stonehill College, Fr. David Tyson, C.S.C. will preside. Interment will follow at Holy Cross Cemetery on the Stonehill College campus. Reverend Donald W. Whipple, C.S.C. NOTRE DAME, IN----The Reverend Donald W. Whipple, C.S.C. 82, died at Holy Cross House in Notre Dame, IN on February 24th, 2011. He was born on May 19, 1928, the son of the late Caldwell A. and Catherine (Welch) Whipple, in Newport, RI. 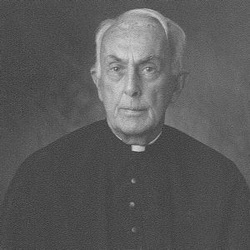 He entered the Eastern Province of the Congregation of Holy Cross in 1948 at Stonehill College, professed final vows on August 16, 1953 and was ordained a priest on June 6, 1957. He was awarded his B.A. from the University of Notre Dame in 1953 and studied theology at Holy Cross College in Washington, D.C.
Fr. Whipple served on the faculty of Notre Dame High School in Bridgeport, CT, Bennington Catholic High School in Bennington, VT, St. Peter’s High School in Gloucester, MA and Moreau High School in Hayward, CA. He provided parish assistance in the Archdioceses of New York, Los Angeles and Sante Fe and in the Dioceses of Orlando and Burlington. He also ministered to the members of the Congregation of Holy Cross as confessor at the Holy Cross Novitiate in Bennington, VT and as manager of Christopher Lodge in Cocoa Beach, FL. Fr. Whipple is survived by his sister, Catherine Whipple of Newport. His brother, Caldwell A. Whipple, Jr., is deceased. Visitation on Tuesday, March 1st from 9:00 to 9:45 a.m. followed by a Mass of Christian Burial at 10:00 a.m. at St. Joseph Chapel, Holy Cross Center, 500 Washington Street, North Easton, MA. Burial to follow in St. Columba’s Cemetery in Middletown, RI. In lieu of flowers donations can be made to: Congregation of Holy Cross, 835 Clinton Ave., Bridgeport, CT 06604. NORTH DARTMOUTH----The Rev. Douglas W. Hawkins, CSC, 80, died at Sacred Heart Home in New Bedford, MA on March 3, 2011 due to complications following recent surgery. Fr. Hawkins was born on April 29, 1930 in Fitchburg, MA, the son of Harold and Eva (Shurtlit) Hawkins. 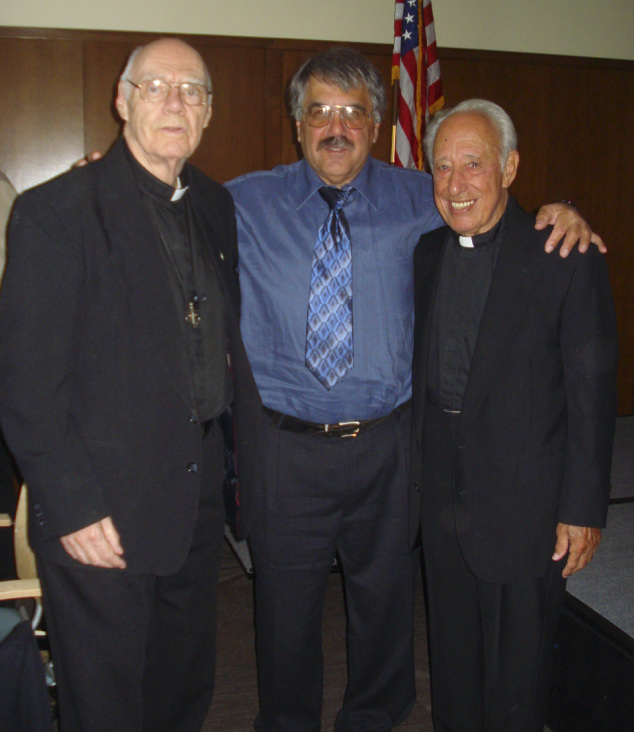 He entered Our Lady of Holy Cross Seminary in 1948 and received his B.A. from Stonehill College in 1953. He studied theology at the Gregorian University in Rome from 1953 to 1955. He made his first and final profession of vows in the Congregation of Holy Cross on August 16, 1951 and 1954, respectively. He was ordained a priest on March 16, 1957. Fr. Hawkins received a M.Ed. from Fairfield University in 1962 and a M.S.in Mathematics from New York University in 1967. Fr. Hawkins taught at Notre Dame High School in Bridgeport, CT, Bennington Catholic High School, Bennington, VT, and St. Peter’s High School in Gloucester, MA. He served as the principal at St. Peter’s High School in Gloucester, MA and Holy Saviour Menard School in Alexandria, LA. Following his ministry as an educator, Fr. Hawkins served for over 30 years as a pastor and pastoral assistant in the Diocese of Burlington, VT, serving in parishes in St. Albans, Bethel, Chester, Brandon, Wilmington, and in other localities as needed. He was the superior at the Holy Cross Residence in North Darmouth, MA from 2004 to 2007, and, after further parish assistance in Vermont, resided there until shortly before his death. Fr. Hawkins is survived by his brother, Alan H. Hawkins of Leominster and nieces and nephews. He is preceded in death by his parents and his sister Edith Taylor. Visitation will be from 7:00 to 9:00 PM at St. Joseph’s Chapel, Holy Cross Center on the campus of Stonehill College in North Easton, MA on Sunday, March 6th with a Vigil Service at 8:00 p.m. The Mass of Christian Burial will be celebrated at St. Joseph’s Chapel on Monday, March 7th at 10:00 a.m. Interment will follow at Holy Cross Cemetery on the Stonehill College campus.